against typical notions of composition and technique. 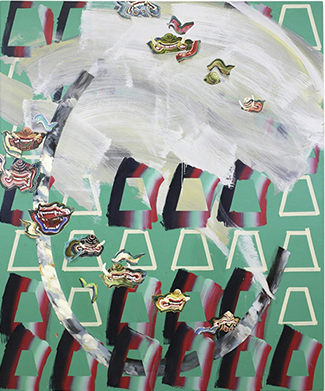 Zhang’s work juxtaposes a patterned ground with moments of painterly expression. 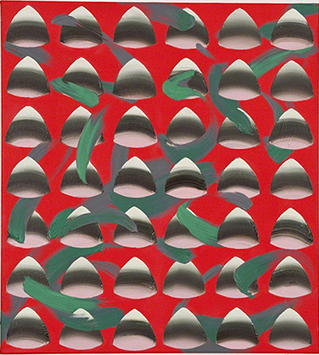 When not regulated by pattern, her marks are gestural and florid, resembling artists such as Tomory Dodge. Many of her paintings echo one another. 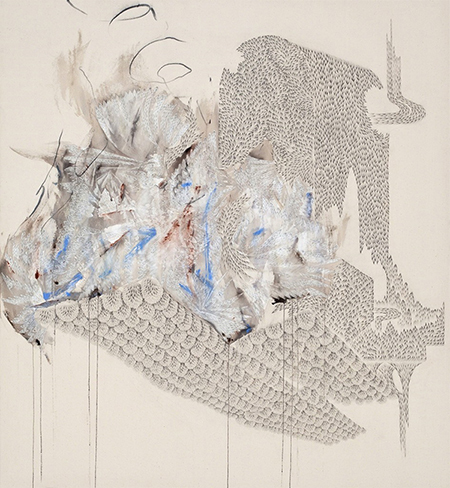 As she describes, “I wanted to see if I could develop a self-referential process in my way of working, so that the motifs in my work would evolve to inform the motif used in the next work and so on, denying the possibility of impetuous external references coming into play.” In works such as Folded Stencil (Generosity) (2013) and Untitled(2014), respectively, Zhang’s colorful, repeating grounds are highly regulated and the painterly perturbances are minimal. 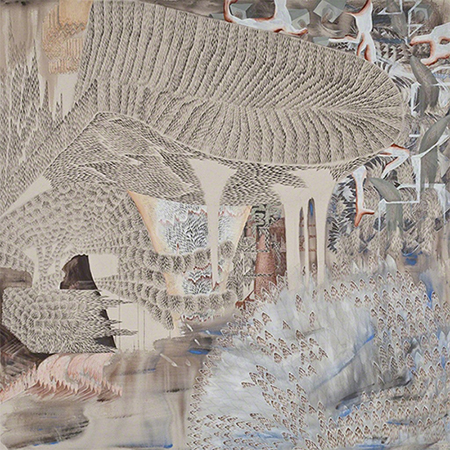 Often, the images interpenetrate, as in Stencil Negative (Not Dragons Not)(2014), in which a repeated pattern is sometimes covered over by brushy white paint. In other places on the same canvas the patterns sit on top confusing the order of execution. 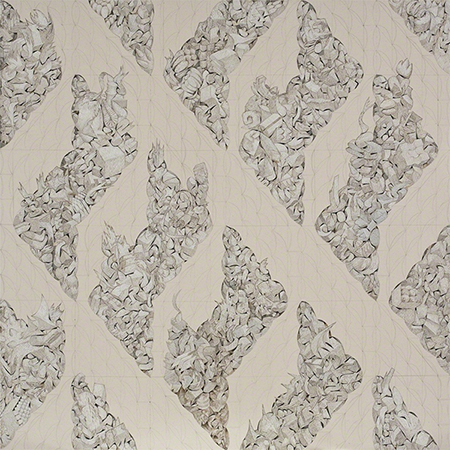 Jeong’s work is densely layered, often using patterns to build larger forms, or using small images accumulated into repeating shapes, similar to the work of Garth Weiser. Many of the patterns she uses—composed in black paint on unprimed canvas—resemble the stylized brushwork of East Asian ink-and-wash paintings. The Mass II and Volume I (both 2012) employ tiled bushy forms, like snakeskin, plant matter, or fire. Similar patterns are built up in sepia tones, with blue accents throughout the image. Watery brushmarks appear in places, as in the lower left ofVolume 1, but quickly either evaporate or develop into more concrete forms. 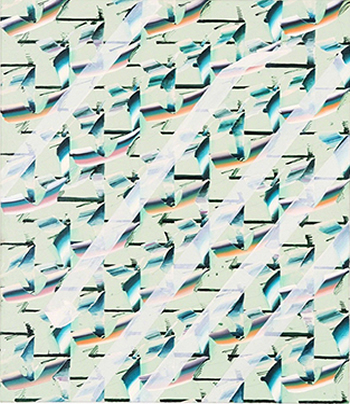 In some works, such as Axonometric Jungle 3 (2011), those concrete passages include geometric forms, both in small-scale building blocks, and in the larger pattern to which they contribute—here, parallel bands of a Z-like shape slanting from upper left to bottom right. Both artists use references to modernist art and traditional forms as well as design and textiles. 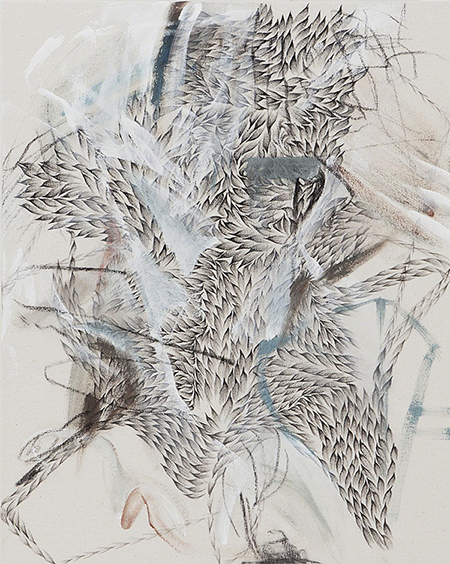 Their work utilizes careful discipline punctuated by moments of aesthetic unruliness. Jeong and Zhang are excellent examples of old-school technical prowess and contemporary free-spiritedness. Visit Rook & Raven at Art Central 2015, Booth R2, Hong Kong, Mar. 14–16, 2015. Follow Rook & Raven on Artsy.